In the words of Beauty and the Beast's semi funny clock, Cogworth, "If it's not Baroque, don't fix it." Crickets. I get a kick out of that joke every time. Anyways, everywhere I go I gotta here this song, Versace, Versace, Versace. Then on top of that I'm seeing the print EVERYWHERE. The Eva Varro Collection gives us Versace flashy good fun in plus size fashion and the push I need to actually try this print. Before now, I've been just plain scared. I've gone back and forth in my head a million times. Can I pull this off? As said before, I've seen the print everywhere, but this is the best one I've seen thus far in plus sizes. I'm kind of excited to try it. Would you rock this? Collection and other pieces can be found here. Style Note: I love the runways and often want to implement things that I am seeing on them. 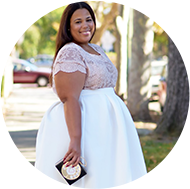 A lot of the complaints of plus size fashion is that the looks, but with a little internet research and creativity you can really capture a lot of the looks and for a more budget friendly price. I'm loving the prints on these dresses. I'm really just now getting into prints. For years I was told because I'm plus size that I should stick to solid colors but now, I'm getting more comfortable rocking more prints. I would definitely wear these pieces! Can't wait to see you in one of the dresses. Boooo!!!! Don't listen to that mess you can def. wear what you want! Hahaha! Chastity, I love that joke, it makes me laugh every. single. time. I'm glad someone else understands it. I'm with Janae too, I thought that I could only wear solid colors, but you are such an inspiration, I am really considering these. They look stunning.